Onix Liss Botox Cleanser is a powerful builder of the hair fiber, tint the wires by removing the unwanted shades of yellow, at the same time treats, smooths and reduces volume. Onix Liss Botox Cleanser is a powerful builder of the hair fiber, tint the wires by removing the unwanted shades of yellow, at the same time treats, smooths and reduces volume. Moisturizes giving the threads more shine, softness and silky. It is compatible with any chemistry and hair having a durability of 20 to 30 days with the exception of growth. Hair can be washed immediately after application. 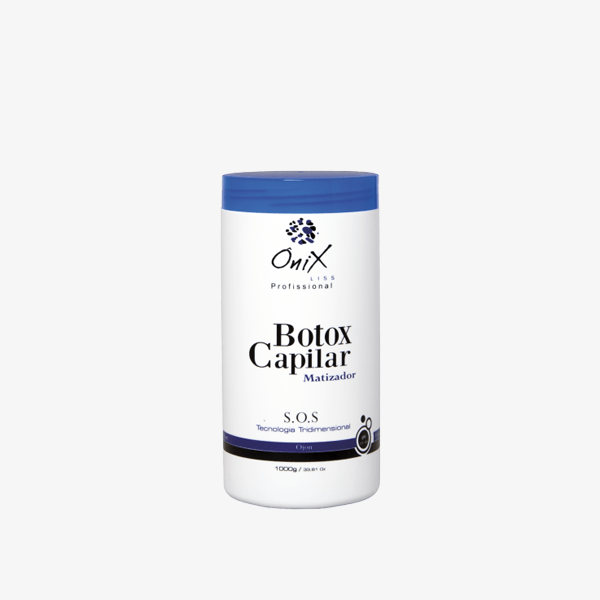 Composed by Botox Capilar 1Kg (pH, 0) – It is a debitter, it treats the whole structure of the fiber, keeping the threads aligned, nourished, strong, healthy and without frizz. The Ojon Oil base is perfect for restoring the vitality of the threads, promotes deep hydration and malleability to the threads. Moisturizes giving the threads more shine, softness and silky. Blonds, with highlights and gray hairs. Wet the hair and apply the Anti-residue shampoo of Onix Liss, rubbing well all the hair from the root to the tips. Apply shampoo again by repeating the same process. Then rinse all the hair and dry it 100%. Start applying the product with the aid of comb and brush. Pass the product only on the top of the wick, close to the root, with the comb spread the product until the tips. Let it act for 15 minutes prefer to use thermal ring. Rinse the hair and with the towel remove the excess water. Divide the part applied in fine wicks. Then brush and plank.